Our resources are developing applications in Android since 5 years. We have good experience with programming in JAVA / XML and use of SQ-Lite database. We are well versed with the use of Eclipse and Android Studio. "I am very thankful to work with Techugo and amazed at the help they gave me to create an affordable app that properly functions." "PowerCode went above and beyond my requirements to make sure nothing was missed." Globus App: "We have developed a mobile app for Globus Hypermarket Chain presented in Germany, Czech Republic and Russia. The app allows to create shopping lists that are managed by gestures. We tried to make them..."
"Quite a reliable partner for a long-term relationship." "Excellent developers and very polite in communication. I am impressed with their level of expertise in development and most important thing is they do the project within your budget and dont..."
"One of the best upcoming app development companies. Anurag and Shahid, the two main developers built our complex platform with ease. Explaining requirements was a one time affair and with th..."
"Very strong technical expertise, amazing design skills, good project management." "Working with Consagous was great. They made some great recommendations for my website and app and adjusted their solutions to fully meet my requirements." "Good energetic team that will work hard for you." At Nomtek we're experts on Android development. "Nomtek delivers high-quality teams and well-designed software to build great products. Capable of doing very sophisticated things in a short time and under pressure in a very flexible and we..."
"I had a great experience with RipenApps team in development of my mobile application and web platforms. The team is highly knowledgeable in domain and have fine ability to solve complex ..."
"Great firm to work with. Excellent communication, prompt response to alteration requests, timely completion and feed backs. Very positive attitude to frequent requests for additions or chan..."
"GTS Infosoft is a company that we've worked with to developed two platforms in the past few months, and they have really delivered beyond expectations. They are experts in their field, they ..."
"Good, professional team. I truly recommends 180 Creative team for small and big projects as well. They will prepare you solid software. You can call them anytime. They are always picking up ..."
Zdrovit You&Me: "For the needs of You&Me Pharmacies Loyalty Program – it was necessary to create a tool for managing customers contracts. On the Y&M’s website the managers of pharmacies have access to all the info..."
"NoGravity, fully met our expectations and may be recommended as a reliable partner." "Highly Recommended. It was a small project with a budget of only $200 but team worked with complete focus and dedication. They sometime even helped me outside project scope. I am expectin..."
"We have enjoyed working with them and look forward to continually working with them on our project in the future." "I'm very happy with Yudiz. I would rate them with 5 stars all around and will definitely be working on other projects with them in the future." Heyway: "Use Heyway to organize and post events, chat, exchange photos and hang out with friends. Heyway is a socializing app letting you meet new people, set up events as well as connect with your friends and..."
"itCraft is a fully professional company, who developed a highly functional and top quality project. They are excellent cooperator and they played a strong role in designing the app. What is ..."
"Their app development team is amazing, they listen to us properly and list all our requirements in detail. In a few weeks, we get our e-commerce app which is thoroughly tested by Quantum IT..."
"Overall the experience of working with Approutes has been really good. They have the ability to master on any new age technology related to mobility, not limited to Android and iOS (Apple) p..."
GIPHY Cam: "Record your life as a series of GIFs THE CHALLENGE: Developing mobile app based on given requirements and design using OpenGL library for Android. Support of the iOS development OUR SOLUTION: So..."
"Very professional team from top to bottom. They really take on the project like it was their own and take pride in their work and their business." Android dominates the mobile market with over 75% of users worldwide. We've been making bespoke apps for Android since 2010. We'll use the knowledge acquired throughout this time to give you the best solution possible. "Being in a transitional phase of our company - I have found Magora to be flexible and able to adapt to our needs." "I strongly recommend ChromeInfo Technologies to anyone that needs to build a website, software of any kind or mobile application!" "Their team is quite competent." "I have had a very first collaboration with this team and they really surprised me with the quality of work. They have great set of skills in both Android and iPhone applications and have gre..."
"I have done a big software project with Codiant Software Technologies Pvt.Ltd which was a difficult challenge for both of us because of the language differences and the scope of work so wide..."
"I have been extremely impressed by the expertise and customer service of Clover Studio. I highly recommend them for anyone looking to develop a high value app." SoftProdigy has extensive experience building native Android mobile apps using Java and Kotlin. We have developed multitude of apps, ranging from small utility apps to some big financial solutions. "SoftProdigy's development team was easy to work with. Importantly, communications were consistent. When issues or complications arose, they were always willing to do whatever it takes to com..."
"Looking forward to continuing a great relationship with Nimblechapps for any future projects that may be down the line!" We create your app for Google’s mobile operating system which is the biggest operating platform in Europe. Meeting the UX standards, we provide you with the ultimate Android solution for low budget. "Startup Creator is an important ally for our startup. If you are not a developer and want to found a tech-startup, you should definitely talk to Startup Creator to make things happen!" "One of the best we have worked with from overseas." SORO app: "SORO is a video messaging apps that allows all users to make free video calls, and voice calls with friends all around the globe. SORO also the gives users the ability to make their conversations publ..."
"Very good to work with and work is done in a timely manner." "I would highly recommend them to anyone that wants to work with a stable company that knows what they are doing." "It is an easy app to use, as my target audience is only fishermen I'm really happy with the result. I normally receive good reviews once people start using the mobile application. In fact, I..."
Ekoplaza: "An organic supermarket chain which wants to support you in a healthy, organic lifestyle. Without synthetic fragrances, colors, flavors or preservatives. Food as it should be! Find, sort, and select f..."
"I highly recommend them. We feel they are very skilled and have provided excellent service." "It was very important to me to get a great response and availability. Perfection Infoweb are always in touch and ready to answer happily about my doubts." Android is a mobile operating system (OS) created by Google. Its founders are Andy Rubin, Rich Miner, Nick Sears, and Chris White, who started the OS in 2003. There are different versions of the OS for Android Auto, Android TV or Android Wear. Although prior versions of the Android OS were based on Linux kernels, the new Fuchsia OS is based on Zircon, developed by by Travis Geiselbrecht. Google I/O is the most popular event for Android app developers worldwide. The conference is focused on web, mobile, and enterprise Android applications. According to the latest reports, the Android smartphones market share increased to an 85.9% in 2017. In fact, the Android OS is the only OS growing year after year, earning 109.65 billion dollars only in 2017, and with more than 3.5 million apps Android apps in the Google Play store. Nowadays, Android is the most extended mobile platform around the world with more than 2 billion monthly active users, so developing apps for Android is always a great option. Although Android users are less prone to pay for apps and buy in-app purchases, there are certainly some advantages when it comes to developing an Android app. For example, Android apps have a high ad revenue, which results in a great opportunity for marketers worldwide. In addition, the validation process by the Google Play Store for Android mobile apps is faster and easier than in other app stores. Given that Android is the most used platform, the development tools are very advanced and the bugs and errors that are found are reported and fixed faster than in other OS. According to our top Android app developers posts, Android apps take longer to develop given the existence of a great number of devices, each with its own specific features, which makes it harder for Android developers to unify. At the same time, developing apps for Android means that you have plenty of possibilities, as developers are able to introduce any kind of feature and customize the apps further. In addition, most Android developers use Material Design, which is a design language created back in 2014 by Google itself and aims at combining a great design with technological innovation. Leading smartphone companies like Samsung, Xiaomi, ZTE, Sony or Huawei are using the Android OS for their mobile devices. In this directory for top Android app developers you will find the best Android development companies worldwide with client reviews validated by the AppFutura team. 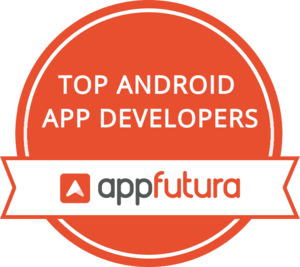 At AppFutura, we have over 5 thousand Android app developers from all around the world. You can start working on your app project with these top Android app developers within our platform by using our safe escrow payment system. Get in touch with the top Android app developers by visiting their website or calling their offices directly. If you’re interested in developing an Android app, you can also send them a message through the AppFutura contact system and ask for a quote. Moreover, if you have a detailed idea of the app you want to build, you could opt for posting an Android app project too.